What a wonderful way to pay tribute to a service member or those who have a deep regard for our national symbol. or as a message that one has gained their wings and flown free. 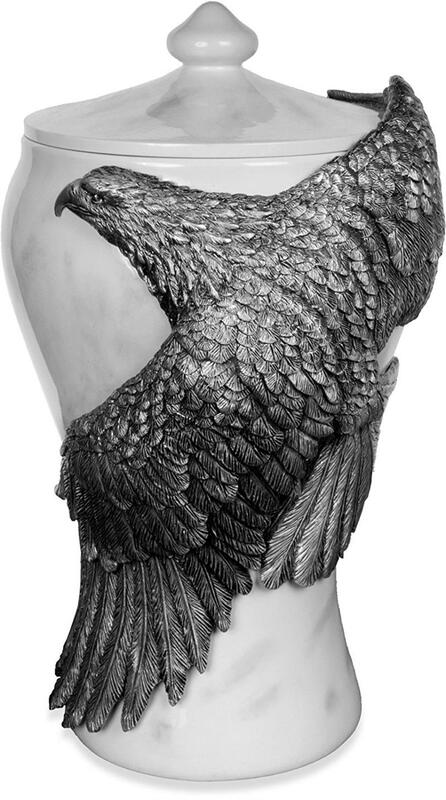 The eagle, a symbol of power and strength in ancient Rome, also conveys the powers and messages of the spirit. It is man's connection to the divine because it flies higher than any other bird. If eagle has appeared, it bestows freedom and courage to look ahead. The eagle is symbolic of the importance of honesty and truthful principles. All of which is conveyed when seeing this majestic bird with it's outstretched wings wrapped around the urn. Made of a high quality resin stone with a marble finish. The captivating pewter eagle is the focal point of this patriotic urn. Details have not been spared on this handpainted piece.